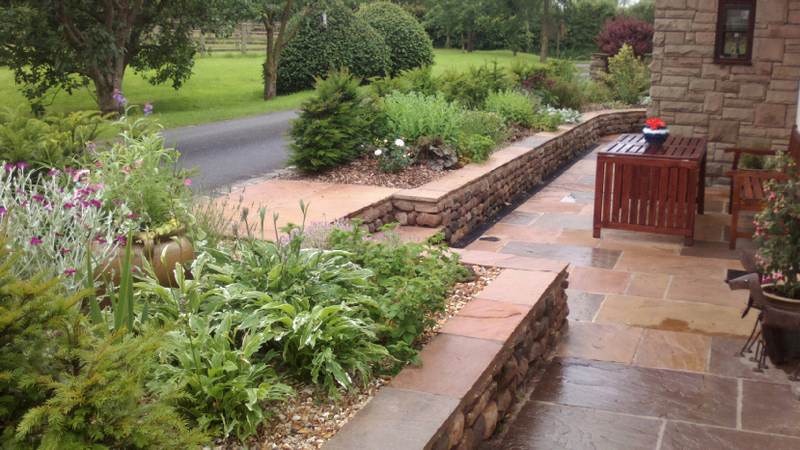 Garden design should ultimately make a garden a fantastic and usable space that ticks all the boxes for the owner. It is exciting to have a new garden and a great layout but planning is vitally important. I’ve seen many garden designs that have been unnecessarily over complicated leading to construction work and costs that should have been avoided – it’s all in the planning! This garden at the front of a property is a very simple design, un-fussy, un-complicated and ticks all the boxes for the clients. 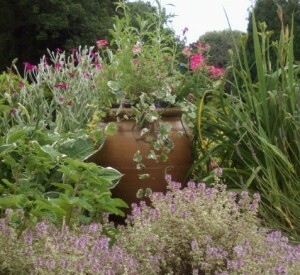 We even limited the choice of materials to just stone walling, stone paving, a large glazed urn and planting. There was no need for anymore. The site was overgrown with shrubs that had been planted when the property was originally constructed some 40 years earlier, these had grown too big and were blocking light from the windows. Drainage was also not ideal with the paths flooding when it rained as the gradient sloped from the lane to the front door. 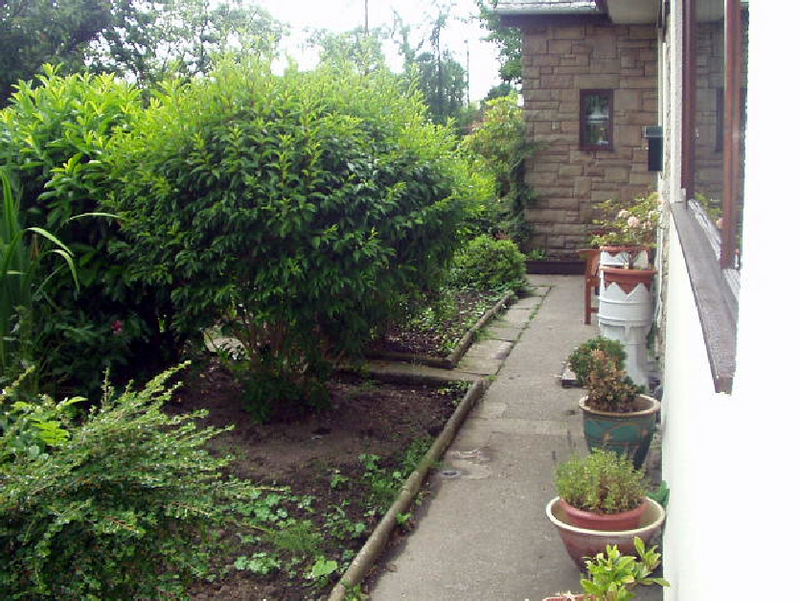 Before, the garden was overgrown, hard to maintain and did nothing to enhance the property. The image to the right shows how uninviting the entrance to the house originally was and the narrow path was an obstacle in itself! The new layout, shown in the image below, enabled raised beds to be built limiting surface water running towards the property. A full length drain was incorporated at the base of the main retaining wall to more than adequately cope with any flooding. Creating a simple layout meant that we could make a large seating area directly outside the house where none had existed before, this gets all the sun and is great for sitting out in an evening. The new design enables a far better use of the area for sitting and dining. Maintenance is far easier and the whole property has been improved. 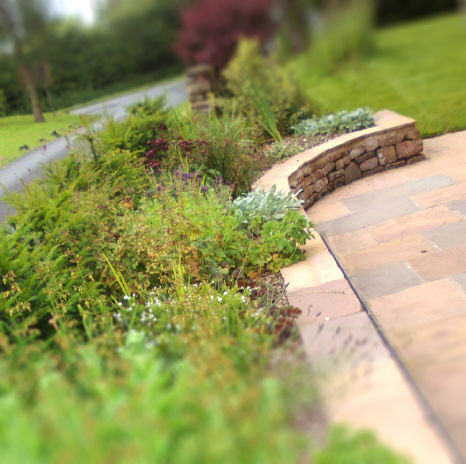 All garden design needs careful planning to get the best from a site. At the far end of the raised bed the wall curves around to make an entrance onto the existing lawn.